I have found a real help in sleeping, The True Sleeper. Being disabled myself, sleeping can be a real problem, not only sleeping itself but pain as well. The True sleeper lets me sleep. Ii instantly transforms any bed into a rejuvenating sleep system… giving you the comfort and support you need to get a good sleep. advanced Visco-elastic foam that was originally developed for NASA! If you toss and turn all night and never wake up feeling refreshed then consider the True Sleeper by Thane. True Sleeper’s visco-elastic foam was originally developed for NASA to cushion astronauts from excessive g-forces during lift off. The same material is used in hospitals, nursing homes, burn units, and sleep clinics to make patients more comfortable and help eliminate sleep discomfort. in wonderful comfort… reducing those pressure points and helping to naturally align your spine. True sleeper is like a custom made bed that fits you perfectly – without having to replace your existing bed! The True Sleeper Topper comes in any mattress size…. 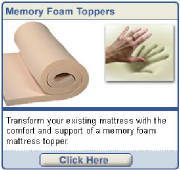 Moreover, fits right on your existing mattress and you use your same sheets! The True Sleeper automatically adjusts to you, allowing you to reach your natural sleep position! * In addition, you will get the True Sleeper, Tips for Better Sleep Brochure. You will not have to replace your own bed just put a True sleeper on top of the mattress and you are on your way to a wonderful sleep. Thane International, Inc. ranks among the leading direct response and retail marketers in the world. In business for over 10 years, Thane has created highly successful brands in such diverse product categories as health & beauty, fitness, weight loss, kitchen/house wares, entertainment, self-improvement and pet care. Thane's global marketing and distribution operations extend across all continents, and its products are sold in over 80 countries worldwide. As a result of its vast success in product development and consumer marketing, the company attracts product owners throughout the world who turn to Thane as their exclusive marketing ally. This means we are able to offer our customers the most unique, innovative, and highest quality products available anywhere. I love my True sleeper as I am sure you will too.